If you don’t need a big towing capacity but still want the versatility of a large, seven-seat, all-wheel drive wagon, there are plenty of SUVs to choose from. 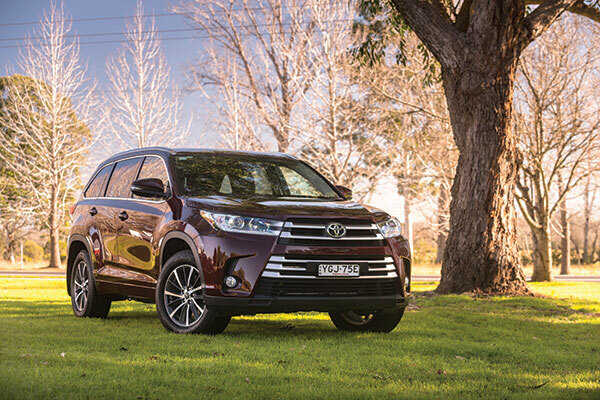 The most popular wagon in Australia is the Toyota Kluger. It’s been updated for 2017 with more power, a new transmission, cosmetic upgrades and infotainment improvements. The Kluger is up against vehicles such as the Hyundai Santa Fe, Kia Sorento, Mazda CX-9 and Nissan Pathfinder, but outsells each of them at a rate of about two-to-one. Like the Mazda and Nissan, Toyota only offers the Kluger with a petrol engine; for a fuel-sipping diesel, you have to turn to Hyundai or Kia. Changes to MY17 Kluger include a new grille, repositioned LED daytime running lights, LED taillights, new alloy wheels and improved standard features. 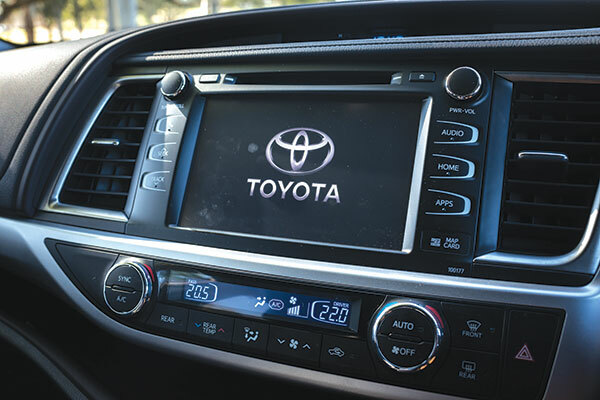 For the Kluger GXL, new features include an 8in touchscreen incorporating satellite navigation, and DAB+ digital radio, power tailgate and separate opening tailgate glass. Direct fuel injection has been incorporated into the 3.5L V6, and compression is higher at 11.8:1 (previously 10.8:1). Power and torque outputs are up 17kW and 13Nm. Toyota claims fuel-efficiency and emission figures are lower too, by 10.4 per cent on AWD models like the GXL tested here. The transmission is new – there’s now an eight-speed unit in place of the old six-speed. First to sixth gears are more bunched up than with the previous six-speed unit, with only seventh and eight overdrive ratios (although the final drive is much taller, going from 4.154:1 to 3.003:1). Standard Kluger equipment includes seven airbags, reversing camera, reverse-parking sensors and a safety suite that most new vehicles have, including stability control. However, there’s no trailer sway control. 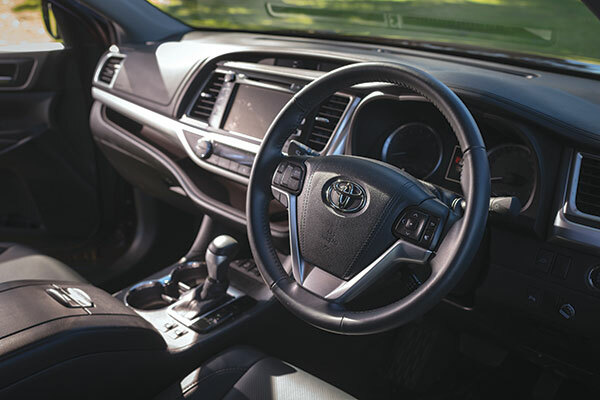 All Klugers also have cruise control, electric power steering, six-speaker display audio with Toyota Link5 connected mobility, front fog lights, privacy glass and power-adjustable exterior mirrors. The GXL also gets three-zone climate-control, key less entry and ignition, roof rails, premium steering wheel and shift knob, leather seats (heated at the front) and a power-adjustable driver’s seat. None of this comes cheap, of course. The new GXL AWD, at $57,550 (plus on-road costs), is up $2360 over the MY16 version. 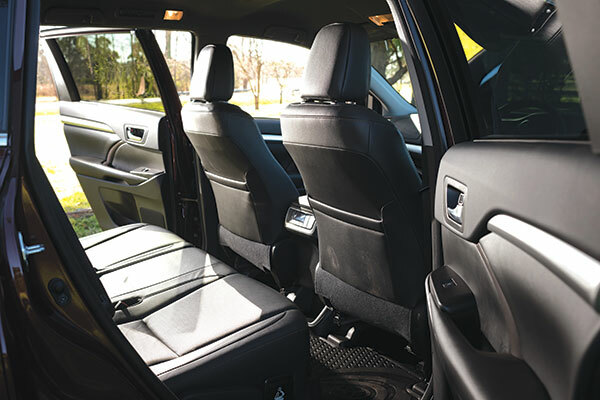 The Kluger’s interior is spacious with ample room for seven occupants. Even adults sitting in the third row won’t need to fold themselves into the seat (the second-row seats have fore-aft adjustment, allowing third-rowers the option of more knee room). The third row seats are close to the floor, making for a knees-up seating position, but at least it offers ceiling air vents and ample storage. Up front in the driver’s seat, you’ve got simple, easy-to-use controls, legible instruments and good vision to the front and sides. Large side mirrors and the rear view camera help to make up for a lack of rear-side window vision. The 3.5L V6 has plenty of punch and sounds good to boot. It’s quick off the mark and while it revs out smoothly if you need it to, for easy, day-to-day driving there appears to be enough low RPM torque. The new transmission shifts imperceptibly and has a good spread of ratios. 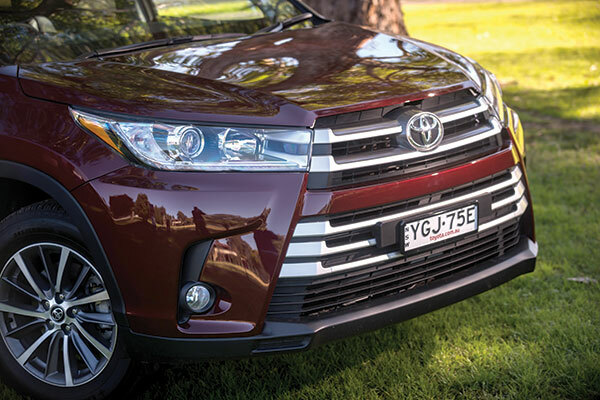 The Kluger doesn’t rise to the top of the class with its ride/handling compromise – it lacks steering feel and doesn’t offer much in the way of dynamics. If you enjoy driving quickly on a twisty road, this is the least appealing vehicle in its class. Perhaps more importantly, in its role as a family urban run-about and holiday tourer, the Kluger rides well. 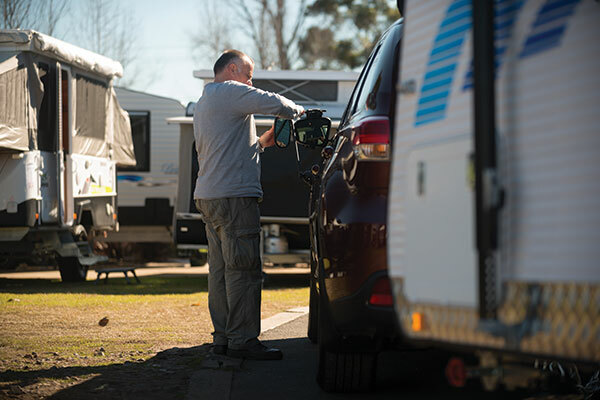 Hitching up is easy with the Kluger, with its reversing camera offering a wide-angled view, and the seven-pin trailer plug and shackle cut-outs are easy to get to. The only minor criticisms here are that it’d be nice if Toyota followed Ford and Land Rover with a 12-pin plug as standard, and if the shackle cut-outs were positioned a little further away from the hitch. That would make them easier to get at. 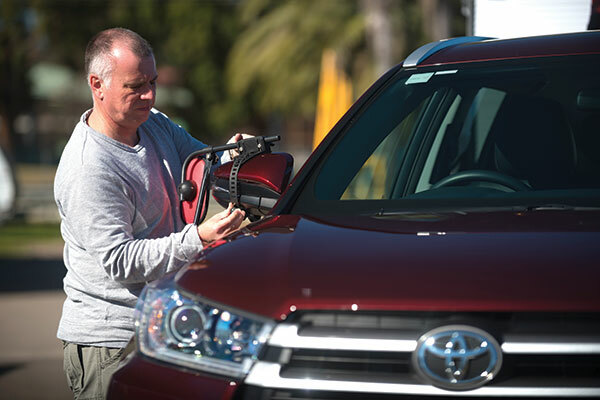 If you use towing mirrors that attach to the vehicle’s mirrors, you’ll find the Kluger’s mirror shells a bit too curved to be ideal, but good enough for getting the towing mirror brackets cinched down tight. With about a 140kg placed on the towball, the Kluger squatted down 22mm at the rear and rose 7mm at the front – not by any means excessive. 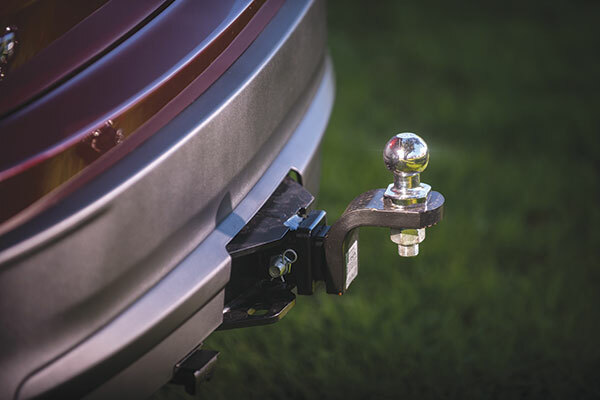 If you had a towball mass approaching the Kluger’s 200kg maximum – and a load in the Kluger’s cargo area – then you might want to invest in a weight distribution hitch for towing. 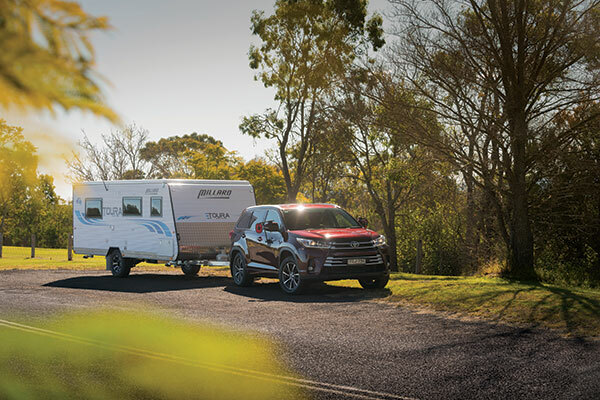 The Kluger settled into an easy cruise on the freeway with the single-axle full-size 1700kg caravan tucked up behind it. 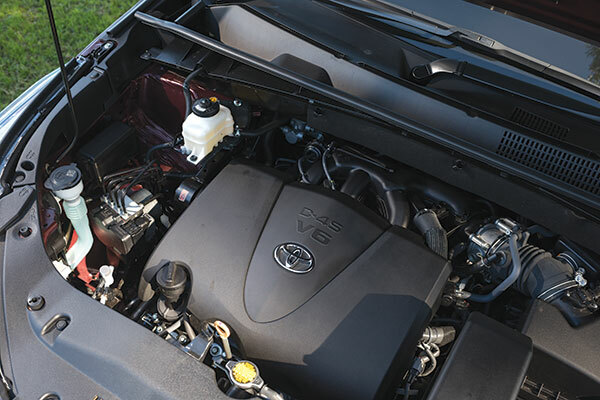 It became obvious when towing that the Kluger lacks low RPM torque – it needed to be revved to be kept on the boil, no surprise given that peak torque arrives at 4700rpm. It wasn’t happy to stay in top gear at 100km/h for very long before a downshift was required. Even when towing in town, the V6 seemed happier accessing its upper rev range to accelerate with traffic. While it needed to be revved to do it, the Kluger certainly delivered on freeway hill climbs, where it was easily able to hold 100km/h. Engine braking was quite poor, which is not unusual for a free-revving petrol engine. 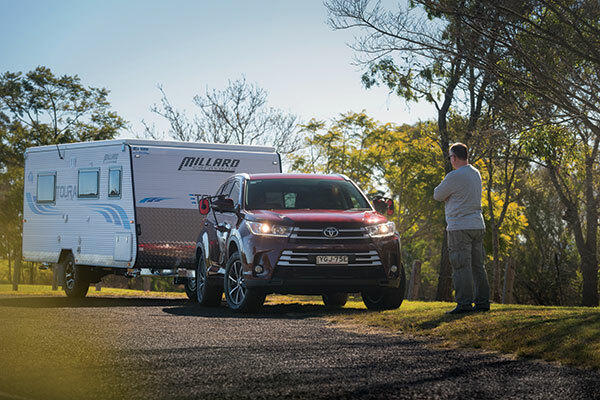 Toyota advises against towing for the first 800km of the vehicle’s life, and to not use cruise control when towing. The Kluger felt well-matched to the caravan we used for this test, with no swaying and very little pitching even on rough, secondary roads. Fuel consumption driving at an easy 100km/h one-up was just 8.6L/100km, which is very good for a bluff, heavy V6 petrol SUV. However, when towing, fuel consumption soared to 19.4L/100km. With plenty of hill-climbing or a long stretch driving into a headwind, it would be easy to see the average climbing higher. Allowing for a 50km safety net, you’d get about 320km out of a tank before needing to think about getting more fuel. 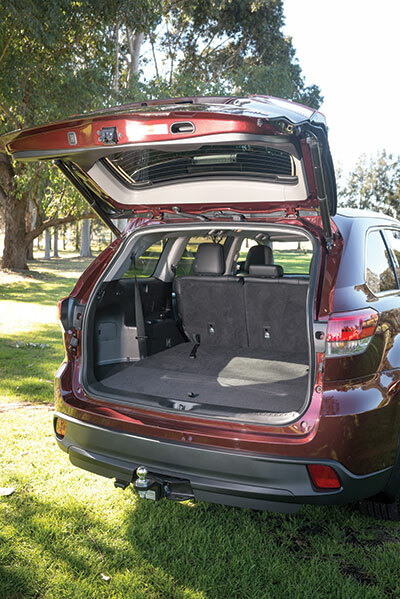 The Kluger is a spacious, comfortable and reasonably nimble wagon, and for towing it offers plenty of performance and a very stable platform. While it is economical when unladen, its towing fuel consumption is high. Thanks to Camden Caravan, 66 Camden Valley Way, Elderslie NSW 2570, for the loan of the caravan for this test. The full tow test appears in Caravan World #567. Subscribe today for the latest caravan reviews and news every month!